Not everyone can look like James Bond, but you may be able to emulate his style, thanks to a Virginia company that produces clothing fit for a secret agent. 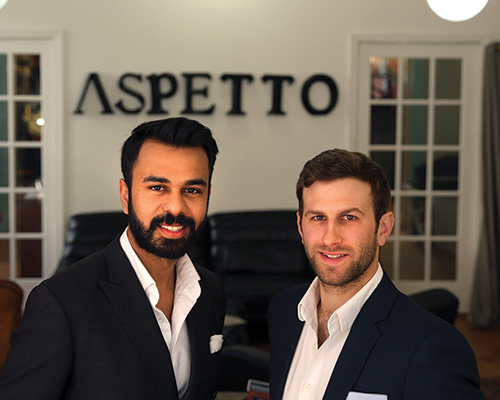 Fredericksburg-based Aspetto makes “ballistic clothing,” in addition to regular menswear. Its products include custom suits with integrated armor, bullet-resistant T-shirts and gear ranging from vests to helmets. The majority of Aspetto’s business is tied to government contracts. Its products are National Institute of Justice certified, the benchmark for bullet-resistant body armor. Abbas Haider, Aspetto’s founder, president and CEO, says his products have been lifesaving. He recalls that an undercover officer who was wearing the company’s bullet-resistant T-shirt survived being shot three times. His survival “was the defining moment for us,” Haider says. Haider began making clothing in 2008 while a student at Mary Washington. He added bullet-resistant clothes to his product line after exploring the concept as part of a marketing-class project. His classmate on that project, Robert Davis, is now Aspetto’s chief operating officer. “We partnered up with a local ballistic company, created a prototype and got an ‘A’ on the project,” says Haider. They stayed in Fredericksburg after graduation because it was affordable and close to Washington, D.C.
Today Aspetto has six employees and hopes to hire more as the company expands. The company says it is the first to manufacture a bullet-resistant clothing line in the U.S. Civilians can buy Aspetto’s clothing but first must pass background checks. The background check isn’t required by law, but Haider says the company believes it should know why customers want their products. After the background checks, Aspetto works with customers to determine the best products for their needs. Production for custom-made ballistic items takes two-and-a-half months. Other items, such as shirts and tailored suits, take four to five weeks. In addition to clothing and ballistic gear, Aspetto offers cybersecurity education services. It evaluates employees on their reactions to cyberattacks and provides training on fighting hackers. “Aspetto is on its way to becoming a one-stop shop for all defense needs,” Davis says.